Ah, the good old Texas Turkey, or Nine-Banded Armadillo. These unusual creatures are common in Texas. They have a bony shell with nine segments, and this provides them with protection. They have a tiny mouth, and they eat insects. They mostly feed on earthworms, which they dig out of the ground. In doing so, they often tear up lawns and landscaping. They also dig burrows in which they live or escape from predators (though the automobile appears to be their most dangerous foe). They dig these burrows anywhere, including right next to your house or under some other part of the building, and they can really remove a lot of dirt, leaving a huge mound next to the house, and less dirt underneath the foundation, which can lead to cracking. If you want an armadillo removed, we can do so, and we humanely trap the animals. We are a professional wildlife removal company, offering armadillo control services. We aren't a pest control or armadillo exterminator company. 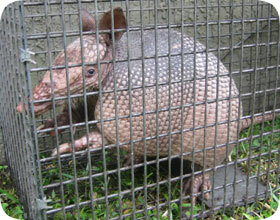 We provide humane armadillo trapping and relocation, and a completely solution to your Houston armadillo problem. Armadillo In The Yard: Will It Leave On Its Own? Armadillos are small animals that can often be harmless and live without ever coming in to contact with humans, but for those that do then they can often become a big problem for people. One of the first things that many people will do is to simply observe the animal to see if it will leave of its own accord, and in some cases this can be successful. It will often depend on the reason that the armadillo has actually come to the yard in the first place, and even if it does leave then it will often return if the yard provides a good source of food or shelter. The Texas armadillo is a creature that can generally cover quite a large area, and will often have a number of different burrows that it can use. It is certainly worth examining your garden to see if there are any features that may be attracting the armadillo to see if they can be removed. If there isn’t an obvious feature in your yard that is attracting the armadillo, or it is difficult to solve, then the solution in this situation is to install an exclusion fence or to repair any holes in the existing fence where the armadillo is getting in. Should I hire a pro, or remove Houston armadillos myself? We have learned that Armadillo behaviour regarding their search for food and shelter can cause destruction on a person’s lawn or yard. The constant digging of holes and destruction of flower beds on a yard propels a person to take the initiative to try and get rid of the armadillos. There are two approaches one can take with regard to removing Houston armadillos if they can become a nuisance to you. •	You can decide to take the initiative to use the methods of removing Armadillos from your yard yourself. There are several methods as explained in the previous documents. •	One may decide to hire a professional Armadillo remove for enhanced removal. These professionals are well equipped to handle the trouble that Armadillos cause in a massive way since they come from organizations that deal with such kind of problems. They probably have more experience with animal trouble so they know how to counter any kind of problem effectively. Deciding to eradicate or remove Armadillos yourself may work if you do it correctly but deciding to hire a professional animal remover may be very effective because of the expertise they provide. The big question in this article is should a person hire a professional or take actions into their own hands in case Texas armadillos bring trouble to their yard. To handle this, it is important to acknowledge the advantages of removing Armadillos yourself and the benefits of hiring a professional. 1. One acquires the experience to remove armadillos themselves after one session of application of one removal methods. One will not need the services of a professional at all if one gets to know the procedures on how to remove these Armadillos from their yards themselves. 2. One knows the sections of their yard where there is intense Armadillos infestation. By taking the step to remove Armadillos from your yard yourself, you will be able to easily know where to go when you see an Armadillo on your yard and remove it as soon as possible. 3. Removing Armadillos yourself makes you save on the costs of having to hire a professional to remove them for you. Hiring professionals requires money and if one gets to know how to remove armadillos from their yards themselves, the cost of having to hire another person to do it for you are saved. 1. One can be educated by the professional on the appropriate methods to remove Texas armadillos from the yard. 2. One is assured of complete removal of the Armadillos from the yard by a complete professional. 3. Professionals can get the job done in a small duration of time. Therefore, hiring a professional may seem like the best option in regards of removing armadillos, doing it yourself may also be a good idea.